“The story often is the narrative of the bad community, the toxicity, and it really annoys me that [it] commands so much of the narrative in games,” he recently told me, as we chatted in a room in the Chelsea Piers fitness and entertainment complex on the western edge of Manhattan. Instead, he wanted to point out something that excites him about No Man’s Sky, two and half years after its rocky debut and the subsequent updates that won so many critics and fans over. “I think what gets lost—and that Gita does a really good job of highlighting—is the nice things people do in games,” he said, name-checking our own Gita Jackson, who has covered player-run governments and other fan creations and experiments in No Man’s Sky for the past couple of years. Murray has seen the best and worst of it since No Man’s Sky first appeared with an incredible trailer during the 2013 Spike gaming awards. He participated in the hype leading up to its summer 2016 release, notoriously promised a multiplayer feature on national television that wasn’t in the game, got scorched by fans upset with what his team at Hello Games originally launched and then slowly, surely, saw the reputation of No Man’s Sky change as years of post-release updates transformed and improved it. “I think we learned lessons, right?” he said, making one of several cheerful understatements as we chatted for a half hour. 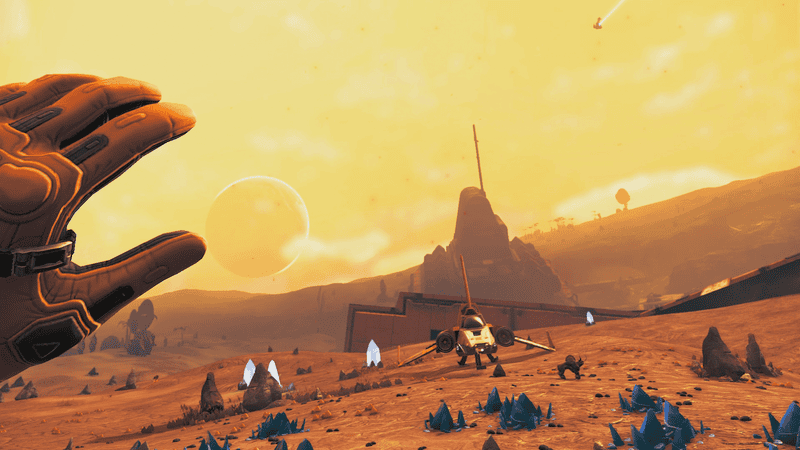 No Man’s Sky has flourished in recent years, rising in regard through the 2017 Atlas Rises update and 2018’s No Man’s Sky Next. While he won’t release sales figures, Murray said that “last year we sold the kind of numbers a AAA game would be happy with at launch,” using the industry jargon for big budget games. The game’s next update, Beyond, includes an optional virtual reality mode, a new online “experience” and a mysterious third element Murray doesn’t want to mention yet. They were going to be smaller updates, but the work on them ballooned, and it became obvious to the developers that they should bundle them. Murray figured it would help if some people, perhaps the media, could try the VR part in advance, which led him to feeling the need to show some of it earlier than he’d like. This caution is why part of Beyond is still secret and why Murray feels like he’s been more worried about telling people what Beyond is not (“not a subscription, not an MMO”) than what it is. It would be safer and perhaps wiser for No Man’s Sky to skip the hype cycle in the wake of the game’s launch, during which Murray became a poster child for promises gone undelivered—almost a spiritual successor to Peter Molyneux. After that rocky release, Murray and his team decided not to move straight to their next project but instead to stick with No Man’s Sky, delivering upon all of their launch promises and much, much more. He maintains that the core fantasy of exploring a new planet was there from the get-go, but the game didn’t look or run quite was well as it did in trailers and plenty of fans said they didn’t get what they expected. “When it launched I think two things really motivated us,” he said. “One was that we could see people were playing. The general narrative is that they weren’t, that it’s a dead game, which is so common, but the numbers for us were still very impressive. The average play time was 25 hours at launch across many millions of people.” He said some were playing for just an hour and bailing, others for hundreds. The other motivation was to improve the reputation of the team. “The narrative around the game—for all of these games that comes out and act as a lightning rod—is that the team, they were lazy or they made bad decisions or they were dishonest or something like that.” He laughed. “I made bad decisions at times for sure but it really hurt me for the team to have that legacy. They worked so hard.” For most of the game’s development, he said, there were only about six developers on it, somehow putting out this huge game. These days there are fewer skeptics and more fans of Hello Games, more people appreciative of a team that has proven to be dedicated to improving their work and meeting those original expectations of the game’s hype-heated launch.